Any successful business owner will tell you that advertising plays a huge part in gaining clientele. If eager shoppers pass by your storefront they need signage to let them know what's inside, enticing them to come browse, eat, or otherwise patronize your business. You want your sign to be displayed proudly and prominently at all times of the day, even at night, letting prospective customers know who you are and what you have to offer. That's where our gooseneck lights come into play. Don't let shoppers pass you by because your sign is left out in the dark. Display your signage for all to see with these elegant gooseneck lamps. These modern, elegant gooseneck fixtures are the perfect way to add contemporary class and functional value to your business's façade. The domed shade gives this light a modern, artistic flair that matches great with the storefronts in the trendy part of town. With internally lit box signs quickly going out of style, you can show your prospective clientele that you are on the up and up with today's tastes. 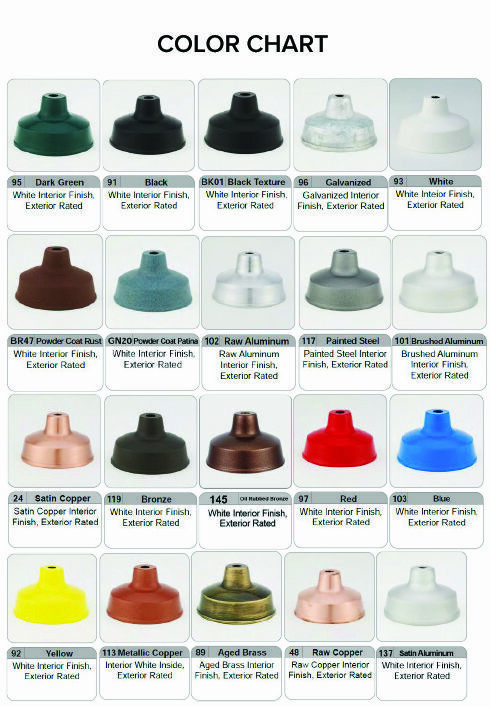 Each gooseneck light can be customized with one of two-dozen finish colors. Bold primary hues give a vibrant, contemporary feel to your façade, while muted tones like patina and rust are great for those seeking a rustic charm. We also offer gleaming metal tone finishes for an industrial appeal. All of our powder coat finishes will help to keep your outdoor lighting protected from the elements and prevent rusting too. All of our outdoor fixtures can be used as indoor gooseneck lights. Other customization options for this gooseneck RLM light include a swivel shade for directional lighting and a number of alternate arm configurations to meet your specific design needs. Each aluminum fixture includes a 4 5/8" round cast aluminum wall mounting plate. This mounting plate fits over a round or octagonal 4" recessed junction box.